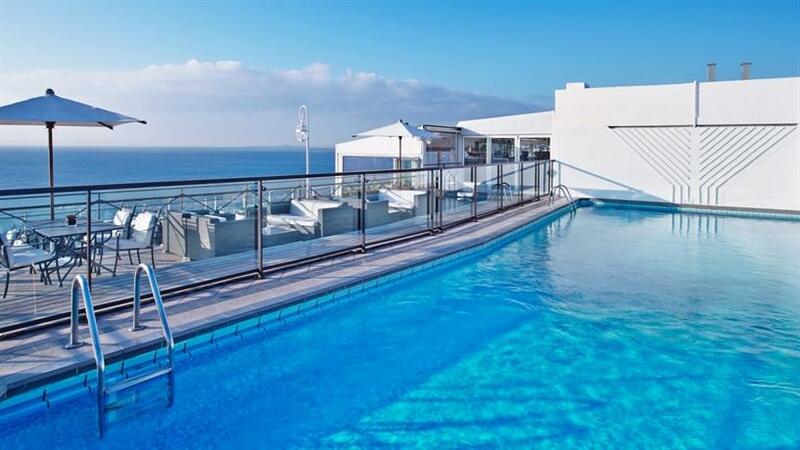 Located on the 10th floor of the 4 star Le Meridien Nice the rooftop pool offers panoramic views of Baie des Anges, the Mediterranean sea and Nice city centre. The heated outdoor pool features a tile pool deck, towels upon request, and a pool side bar known as La Terasse. La Terrasse offers a relaxed rooftop setting including soft deck furniture, sun umbrellas, and shade planters. La Terasse is open from noon to 10:00 p.m. daily and offers non alcoholic, and alcoholic beverages as well as classic Mediterranean fare. The pool is open 9:00 a.m. to 6:00 p.m. daily, and is free for hotel guests. The pool is 50 feet by 16 feet in dimension.